Going to the two day UK Conference at a time of celestial alignments, proved to be an intensive experience. Writing it up over the following few weeks has allowed this writer to relive the power of the work Cobra and Isis are doing. So, we might ask, what is the point? What is Cobra actually doing? And what role is being played by Isis? These are legitimate questions, made even more apposite by the extraordinary behaviour of the smooth man and the hairy man (see Part 4). For with their juvenile intervention we were treated to a contrast between two people actually preparing participants for a shift in consciousness, in contrast to two people who believed they were doing something similar (we must assume) but were engaged in something quite the opposite. So what is going on? For some attending much of the information will have been new, for others, some will have been familiar, at least in the broad brush-strokes. Cobra does respond to any legitimate questions asked (Cobra will say nothing about country of origin or similar.) As with the Alexandra Meadows and Rob Potter interviews, no matter how obscure the question, the responses are swift and (if necessary) detailed. Cobra knows the topics referred to in detail. Now we may assume that those in the Cabal who are aware of Cobra’s activity will have been able to establish an identity - but that is not really the point. The credibility of Isis’s and Cobra’s work, is determined by the effect it has on the consciousness of those hearing it. It is nothing to do with their place of birth or birth name. This is why both Cobra and Isis insist their work is energetic. They are - this writer suggests - doorkeepers to portals – and the portals are in our own consciousness. It is one thing to read material surrounded by the EMF of the computer screen, it is quite another to hear information presented with all the cadences of the human voice. Going to a Conference allows this. We are - in effect - the dreamers of a new reality. When this dream is coherent enough - or when sufficient numbers resonate at a particular level and with particular insights, The Event can occur. By being with other relatively ordinary people, sharing extra-ordinary ideas, the sense that these ideas are deeply true is more than just a hope or a fancy, it becomes a real possession in consciousness. That being so, we all become integers in the change we wish to see. Cobra and Isis are - it seems to this writer - working to shift the harmonics of consciousness of those who are truly open to their information (which then becomes more than merely informative. It provides a pathway to what might be. For the writer there was a big ah ha moment: a time of hairs standing up on arms. This came when Isis spoke about the Vortex, the Goddess and Time. A vortex has a spiral structure. So forgive me now making the next part personal, for there was a major synchronicity. At about the time Cobra first started his blog I was writing my first novel. The ideas flowed swiftly and I’d completed the first draft of a 120,000 word novel in six weeks. Generally the key ideas occurred to me at night. Some of what I wrote about my main character, Rhory, I based on personal experience. And I realised this year, reading some of Rob Potter’s interviews with the guy astral projecting in Bali, that I had as a child, regularly left my physical body and undertaken astral flights. I now think this is one of the reasons I have always had certainty about God, the after-life and ET’s. In the novel, Time Sphere, Rhory becomes aware of other youngsters of the same age (just turning 13) at different time periods. I ‘made up’ a bit of theory to justify to Rhory what was occurring; so you can imagine my feelings when Isis suggested that time travels in spirals. This was exactly the ‘theory’ I had seen in a waking dream. I envisaged all my key characters (seven of them to be discovered over three books) becoming aware of each other at the same time. In other words they all were at the same point on the spiral, except at a different ‘level’ of time. All seven will have to co-ordinate in the third novel to prevent time flowing where the followers of the duplicitous god Set (essentially the Annunaki following Cabal) wish it to, but to ensure it flows as it should as we return now to Galactic Day (and the chance of the Age of Gold being reflected here on Earth - and Earth transformed. In this transformation, the energy of the Goddess (Isis and Maat) plays an important role, for Rhory and the others come into contact with the Priestesses of the Feather - the priestesses who follow the Truth of Maat. I do not spell this out in the blurb about the book - as you can imagine - but essentially that is what is being explored. 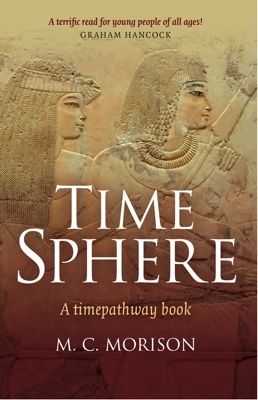 You can learn more about Time Sphere here. You can read some early chapters here. Here is what some people have said. The first are some very kind words by the author and broadcaster Graham Hancock. It’s a cracking good read with lots of action and endearing, convincing characters—yet at the same time, it also explores the deeper mysteries of life in a fascinating and exciting way ~ Teresa B.